Julius’ Head of Strategic Partnerships, Karin Swanson, will be attending ANA’s Brand Masters Conference next week. Below is a glimpse into what she’s looking forward to at the event. 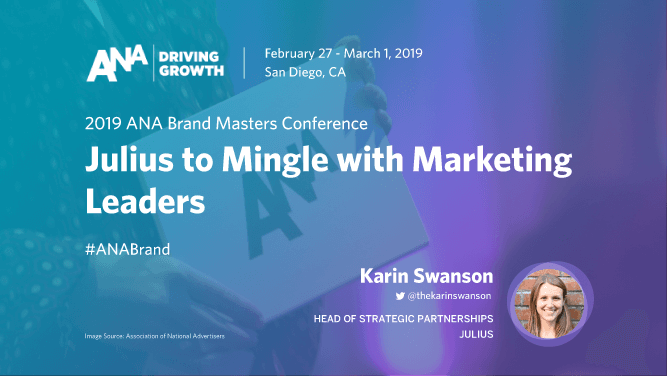 Marketers around the country will flock to sunny San Diego from February 27th to March 1st for ANA’s Brand Masters Conference, presented by Twitter. Agency partners will also take center stage, with executives from Edelman, Droga5, Saatchi & Saatchi, Fallon Worldwide, and more slated to speak. Here at Julius, we’re excited to sit in on sessions that will help us stay informed on influencer marketing trends and the trajectory of the industry. Luckily for us, that means almost every session, as influencer programming continues to become horizontally integrated across different marketing and inter-departmental initiatives by a diverse range of brands. As the new kid on the block (at least amongst the legacy brands featured at ANA Brand Masters), MedMen CMO, David Dancer, will discuss the challenges and opportunistic value in launching a brand in the emerging cannabis market. Consumers increasingly seek health and wellness advice from influencers, who can often be more relatable than traditional big pharma advertising (though, not a replacement for professional medical advice). Influencers can offer a unique platform to educate consumers on the health benefits of cannabis – helping shift the perception from a traditionally stigmatized “stoner” culture – with the potential to help companies like MedMen engage with new audiences. Together with Saatchi New York CEO, Andrea Diquez, P&G Vice President of North America Fabric Care, Sundar Raman, will tell the story of the #BradshawStain, a bold advertising experience that unfolded live in front of millions at the 2017 Super Bowl. We’re looking forward to hearing Raman discuss how they pulled off a live activation stunt on broadcast television – featuring a misleading “stain” on Terry Bradshaw’s shirt – that echoed across social and digital in an epic convergence of storytelling formats. First off, who doesn’t love content related to everyone’s favorite black-and-white cookie? (We know Wiz Khalifa does). As a snack that’s remained likable and relevant over the years, OREO Senior Director, Justin Parnell, will surely have fun educating attendees on his tips for building and maintaining a lasting legacy. We look forward to hearing marketers at ANA Brand Masters discuss strategies for addressing both brand challenges and goals. Influencer partnerships, in their variety of forms (celebrity talent, industry experts, social ambassadors, etc.) can be a natural fit for many of the topics speakers are slated to cover – from helping launch a new brand in a controversial space, to serving as a brand’s authentic mouthpiece on social issues, or anchoring a foray into multi-channel integrations (thanks, Terry Bradshaw!). Come by and see me and Brad Halperin at Table 7 during the conference to learn more!